I hadn’t seen Hannah since 2006, but when she came to visit me last weekend, it felt like I’d just seen her a few months ago. (One of the perks of moving all over the country has definitely been getting to connect with friends that I haven’t seen in years.) While we were hanging out Saturday, we ducked into a used music store, and there found an album that would leave neither of us unchanged. I was browsing through the old records, explaining that I had an idle thought that I might decorate with some of the cooler covers because I loved the art. I came across this one, which seemed quaint at first glance. 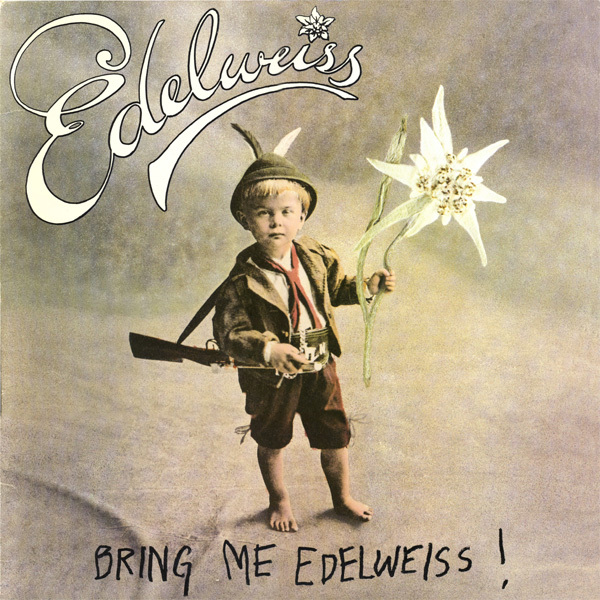 Then we noticed the odd script of “BRING ME EDELWEISS!” below the image. A circle proclaiming, “When you PLAY IT, SAY IT!” adorned the right-hand corner. We later learned that this was a sticker targeted at getting DJs to say the name of the album on-air, but at the time, it seemed like a demand to say the lyrics with the song when you played the album yourself. We must have spent a solid ten minutes laughing at this cover. Then we went home and looked it up, wondering if we could find anything out about this seemingly obscure bit of music. We found it on YouTube. And there are no words. Hannah and I had many excellent, sometimes deep, conversations, about our faith, relationships, the arts, our lives’ challenges and joys. But blatant ABBA ripoffs… angry edelweiss rappers… resampled yodeling… men in lederhosen taking turns slapping each other…this — THIS is the stuff friends bond over. So. True. There are NOT that many people who would willingly stand and mock an album cover with me for ten minutes. That’s when you know you’ve found a true kindred spirit. …And I had somehow forgotten about the men slapping each other. How could I? That will never happen again.